Ye Ode Chocolate Shoppe finished and I won another giveaway! Hi everyone, I finished Chocolate Shoppe last weekend, it was nearly a disaster as I cut through the linen when I realised I had missed the coffee coloured row of stitching at the top, thankfully I managed to cover up my mistake! I am going to get this framed when I have finished other designs in this range because thay are all going onto the same wall in my new kitchen, I also have Ice Cream Sundae still to frame, now that really is one of my favourites, it just makes me want ice cream as soon as I look at it! I am getting ready to stitch Rosie with her posy design next. 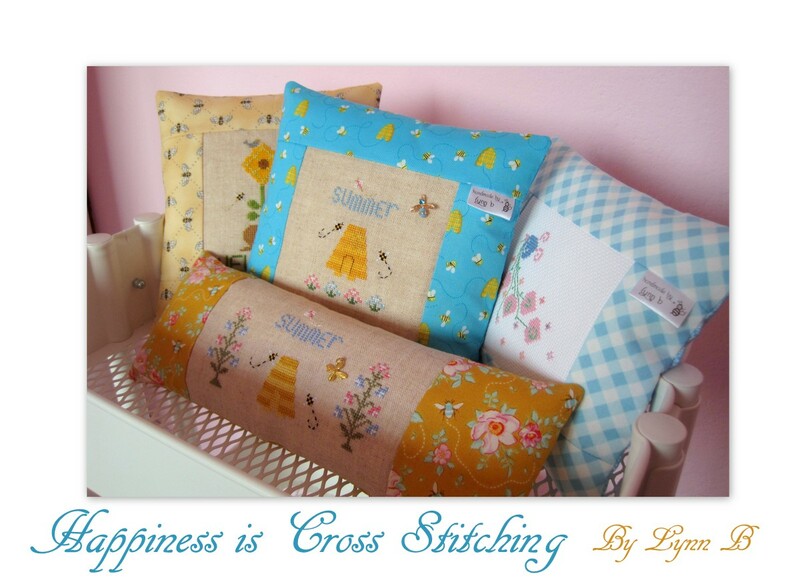 I received some wonderful news the other day, I won Lees giveaway from Notes from Under the Mountain blog here if you have never seen Lees blog then I ask you to go over now as Lee makes some beautiful creations, her embroidery is exquisite! I was so thrilled and excited when I realised I had won the beautiful embroidered bag with another stitched item that will be a surprise made from my choice of colour. I first heard about Lees blog when I saw a beautiful cushion Lee had stitched for another blogger, then I saw this little bag that literally took my breath away here it is called a Pocket for Titania, I am sure you will all agree Lee is a very talented needlewoman! Thankyou Lee, I look forward to receiving your giveaway gift! I have also been planning my third anniversary giveaway for July, I am already stitching another one of my tea bag holders that will be one of my gifts, you all seemed to really like that so I thought I may as well stitch another for the giveaway. I think it will be themed around cupcakes, I have lots of ideas buzzing around in my head, you never know I may change my mind a million times until I actually start the stitching process! Thankyou for all of your lovely comments, they are always appreciated, I would also like to welcome all of my new followers! LHN Ye Olde Chocolate Shoppe work in progress and new stash. Mmmmm Chocolate is one of my favourite things, especially when it is designed by Little House Needleworks, Ye Olde Chocolate Shoppe! I have stitched more on this since I took the photo, so hopefully I will have this finished at the weekend. It has been such a quick stitch but I have really enjoyed stitching it, the colours are lovely. I have also been buying some stash, I chose some linen and another selection of Country Cottage and Little House Needleworks patterns. 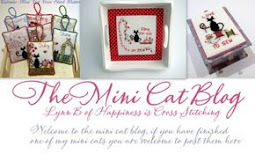 I particularly like the Rosie pattern below, she is just so cute, I think that will be my next project. I also needed some new linen, I bought red, black, pale blue and pink, I have some ideas for the black as I am working on a black and white stitched piece at the moment, it has been a work in progress for quite a while, the black linen is to make accessories to match. I bought the Christmas Red as I am planning to make some red pieces for Christmas this year. I have received some photos recently of the projects that some of my readers have stitched using my patterns, I am hoping to show those in my next post. 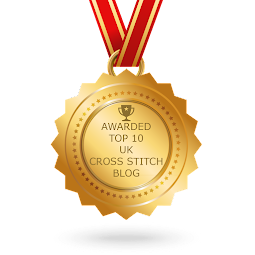 Today I was cutting out the pattern for a new dress I am making so I didn't get much cross stitching done but I have been thinking about my third blog anniversary giveaway gift that I am planning for July, hopefully I can rustle up something that you will all like! Welcome to all of my new followers and thankyou for all of your comments, they are really appreciated! The centre stitches are rhodes stitches, you can see a tutorial for this stitch here (thanks ladies for reminding me of the name) I could not work out on my cross stitch designer how best to show it so I have left it blank, you could always put a couple of cross stitches in there to replace it if you cannot see the stitches from the original photo below. I also don't know why the photo is not clickable, sometimes it is and sometimes it isn't, can anyone help me with this? I have bought some lovely patterns and stash and I have started another Little House Needlework design, I will be showing that tomorrow. 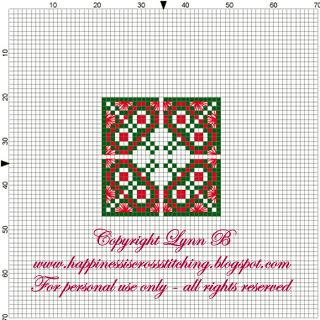 I have been thinking about Christmas over the last couple of weeks and decided to design a little pillow and this is how it turned out, it is quite small, 4.5cm x 4.5cm square - green on one side and red on the other. I stitched it using DMC threads 817 and 699 using Mill Hill gold beads for trimming, hopefully I should have the freebie cross stitch pattern on my blog sometime this week. 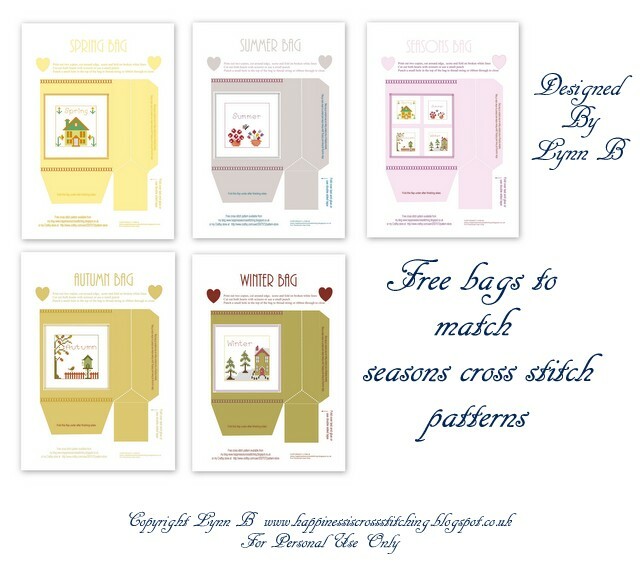 I have been buying some cross stitch patterns again from Little House Needlework and Country Cottage Needlework, I just love these patterns so much, and also some new linen fabric, I will show them on my next post when they arrive! Welcome to all of my new followers and thankyou everyone for the lovely comments on my teabag holder, it seems you quite like the tea themed projects, I think I need to design and stitch more of the same! Don't you just love a cup of freshly brewed tea? I know I do, but sometimes I go into hotels and restaurants and they don't actually have decaf tea, so I have decided to carry my own around in my handbag just in case! Up until now I wrapped my teabags in aluminium foil but now I have this lovely little teabag holder to put them in, I hope you like it as much as I do! 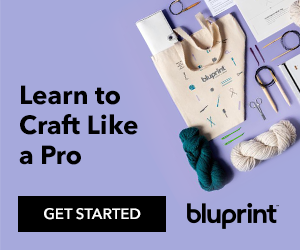 It is made from quilt fabric that has been interfaced with fusible interfacing and lined with a small piece of wadding and fine batiste cotton. The cross stitch pattern is a freebie in the previous post below.